I waited for the impact of his blade, but instead was met with the sound of metal on metal. I looked up at was met with long scarlet hair. The woman wore a short navy blue dress that ended at her knees. He swung his sword and she easily blocked it. She threw a swift kick to his stomach and he was brought to his knees. "You&apos;ve been causing a lot of trouble brother." A deep voice said behind me. I looked and saw,&apos; Siegrain&apos;? I looked back and forth between the two men. They were identical but the new mans tattoo was on his left eye. He smiled at me. "Long story, I will explain shortly." He walked up to the scarlet haired woman and put an arm around her waist. "Erza dear play nice." She rolled her eyes as he pecked her cheek. He walked up to his brother. "Jellal I know what you have been doing in my absence. All you had to do was take care of business," he sighed. Jellal glared at him. "And instead you try to take the throne from me. Naughty boy." Jellal stood and swung his sword. Siegrain quickly lifted his hand and suddenly smoke covered Jellal. Once it cleared,  wooden doll lay where Jellal had just been. It looked just like him. "Now," Siegrain turned around and smiled. Before he could say anything more we heard running feet. Mira,Natsu, Grey, Juvia and a stone soldier with blonde hair came running towards us. "Levy! "Juvia cried. She knelt beside me and held her limp hand. Mira bowed towards the man. "Welcome back Siegrain." He nodded at her. "Someone needs to explain what&apos;s going on. "I said. Erza elbowed Siegrain. "Well that,"he pointed towards Jellal." Is my twin brother. I have been on an extended honeymoon. "He wrapped his arm around Erza again. "While we have been gone Jellal was supposed to act in my stead. My personal guard has been keeping an eye on him for me. "He motioned to Mira, Natsu and the stone soldier. "And apparently there is a lot to be fixed. Starting here." He motioned to Levy. My arms tightened slightly around her. "What do you mean?" he smiled softly. "Im going to show you the true powers of the Puppet Master. Something my idiot brother could never figure out." He knelt in front of me and held his hands, palms out, towards Levy. His hands started to glow.The crack on her face slowly mended itself, her broken hand became whole. "What?" I stared wide eyed. Her clay skin started to become soft flesh. Color rose to her cheeks so she was no longer pale but was still fair. She suddenly coughed and gasped for air. I could feel fresh tears in my eyes as hers opened. The last thing I remember was Gajeel screaming my name. After darkness had fallen over me everything was silent. Then everything became warm. Everything felt strange. I was hyper aware of everything. Two strong arms wrapped around me, my limbs felt heavy, and there was a strange pain in my chest. It was a different pain than when Jellal snap my string. Suddenly I realized I needed air. I coughed and gasped, immediately clearing my foggy head. I could hear again and I heard Gajeel say my name. "Gajeel?" I opened my eyes and met his teary red ones. I smiled a little and I felt a strange moisture in my eyes. Gajeel hugged me close and buried his face in my hair. I weakly wrapped my arms around him as his shoulders shook lightly. The moisture fell from my eyes and I realized I was crying. How was that possible? "Juvia is so happy your alright! "Juvia cried. 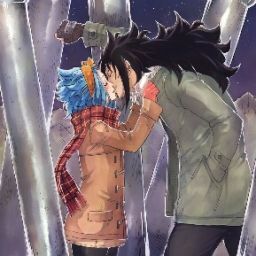 Gajeel and I pulled away but he didn&apos;t let me go. I smiled at Juvia then I saw who was behind her. "Erza!Siegrain!" I grinned. They smiled at me. "Welcome back Levy. "Erza said. "How are you feeling?" Siegrain asked. "Well... I don&apos;t know. "I looked down at my hands and realized my broken hand was broken no longer. It hit me what happened. My eyes flashed up to Siegrain who smiled again. "Did you..." he nodded. "I heard your confession of love at the ball. It was the least I could do." My face felt warm and I covered my cheeks with my hands. He chuckled. "I planned on doing it when I came back anyway." He stood up. "It&apos;s time to get things straightened out. There was a lot to take in. Siegrain explained what had happened ten years ago before he and Erza had gotten married. She too had been a puppet that Jellal got for a bride. She had fallen for Siegrain instead, so he turned her human. These past ten years Jellal had been gathering puppets to use as an army against his brother. Thanks to Mira, Natsu and the stone Soldier, who&apos;s name I learned was Laxus, his plan had failed. Siegrain had gladly turned anyone who asked into a human. Laxus and Juvia included. Siegrain said he would keep Jellal as a puppet until he decided what to do with him. He disagreed with my burning him idea. I was sitting the room that I had claimed this past week. So much had happened and I felt like my head was about to explode. There was a light knock on my door. Levy peeked her head in and I smiled. I was so happy she was back. My heart had felt like it had fallen to pieces when I held her limp body. She walked over to me and gave me her beautiful smile. "What&apos;s up shrimp?" she puffed out her cheeks and I grinned. "Why do you call me that?" "Because I can." I gently grabbed her hand and pulled her into my lap. She smiled and laid her head on my chest. "I love you Gajeel." My heart felt like it would burst. "I love you too Levy". She smiled and tried to hide a yawn. "I feel so weird." She muttered sleepily. "Your tired. Sleep." She was quiet for a moment. "How do I do that?" I couldn&apos;t help but laugh. "Close your eyes and relax. Don&apos;t fight it." She nodded a little. Her head got heavier on my chest after a few minutes and I new she was asleep. I carefully picked her up and laid her in the bed. I brushed the hair out of her face and gently kissed her forehead. She snuggled into the blankets and I smiled. I loved this beautiful girl, I would never let her go again.